Found on page one of Foods, using zip code 90210. You are allowed to print twice per computer. 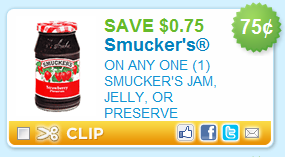 NOTE - if your Shoprite doubles coupons, as some do, the coupon will be worth $1.50 - so then your jam is now free! Buy 5 Get $5.00 off instantly at checkout. The Smuckers Jelly is/was $1.99.